Looking for a fishing derby to take your kids to? 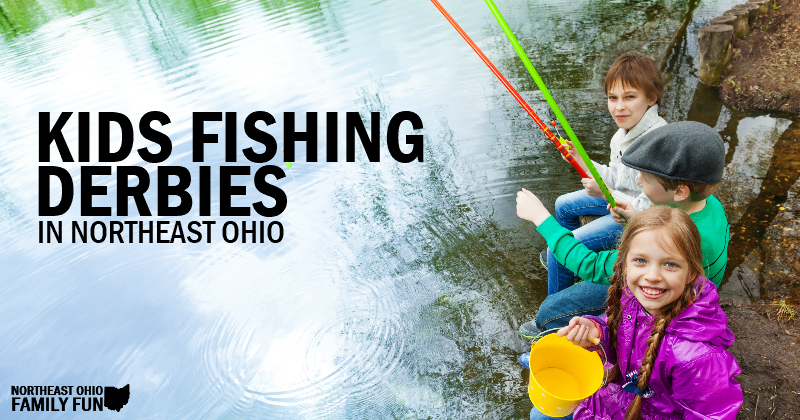 You're in luck because there are quite a few fishing derbies taking place across Northeast Ohio during the spring and summer months. The events give children the opportunity to learn how to fish and join in a friendly competition for a chance to win prizes. So dust off your rods and reels, grab a bucket of bait and head out to one of these events. Note that many require preregistration. Note: Some of the dates are still TBD because this years information has not been published yet. They will be updated as soon as information become available. If you have details on any of these events or know of any other fishing events for kids, please submit the details we'll add it to the list. Cost: $10/car gets you access to all the free programs all day. Cost: $5 cash entry fee will be required at registration the night of the event. The following events typically held each year, but we do not have information for 2019 yet. Once it is available we will update. If you have details on any of these events or know of any other fishing events for kids, please submit the details we'll add it to the list. If you know of any other fishing events for kids, please submit the details or email me and I'll add it to the list. Buffalo Creek Retreat, 8708 Hubbard Valley Rd., Seville, Oh… they’ve got on this website their derby’ s this sat the 26th … but on THEIR webpage it says Sunday…ba shame if someone wastes a trip..
We double checked their website and it shows Saturday, April 27, 2019 from 11am-3pm, which is also what we have listed. If you still find it listed as another time, can you email us with the link to the website you found it on? Danielle@northeastohiofamilyfun.com.